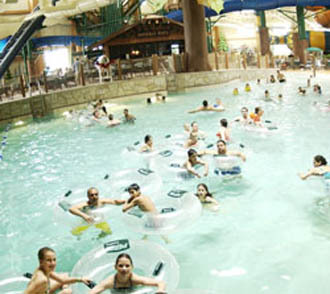 The Great Wolf Lodge Indoor Waterpark in the Pocono Mountains, part of the chain of Great Wolf Resorts, boasts one of the world's largest indoor water parks. Among its highlights are Hydro Plunge, an uphill water roller coaster, and Slaptail Pond, an indoor wave pool. In addition to the water park, the resort includes 400 all-suite guest rooms, a huge arcade with redemption games, and an Aveda Concept Spa. 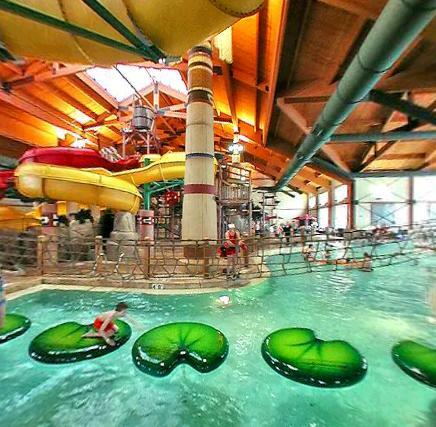 As with all Great Wolf Lodges, the Poconos resort is a veritable kids' paradise and includes the Cub Club with a daily schedule of craftsmaking, and other activities. The log-cabin-style resort opened in 2005. 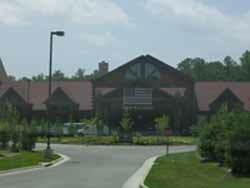 It is on 96-acres off Route 611, just north of the Scotrun exit (# 298) of Interstate 80. The height of the indoor waterslides in the four-story lodge are 50.7 feet high, and the rear section is 63.8 feet high. 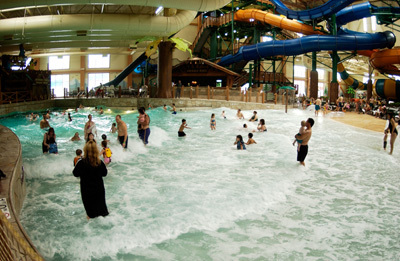 The indoor water park for guests of the Hotel only, features enclosed slides, bridges, geyser sprays, and dumping buckets. 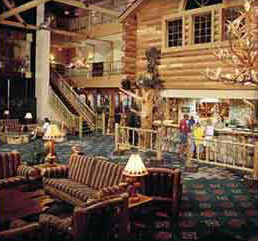 The 4-story log-sided resort has a Grand Lobby, with giant fieldstone fireplace, hand-carved tables, antler chandeliers. 401 all-suite guest rooms come in 10 configurations, including Family Fireplace Suites, and Grizzly Bear Suites that can sleep eight, and children�s themed suites the Wolf Den, KidCabin and KidKamp, each with a �room within a room� for kids. Dining includes a themed family restaurant, fun stuff includes Mascots Wiley� the Wolf and Biko� the Bear, and a Great Clock Tower, in the Grand Lobby, with 8-minute animated �Rhythm of Nature� show, kids love to come in pj's to the nightly bedtime story, in addition to the indoor waterpark there's an outdoor activity pool, Cub Club has daily crafts, activities and bedtime storytelling, MagiQuest interactive fantasy game: like a video-game, but played in a 3-D environment. You'll also find: Northern Lights� Arcade; Aveda® Concept Spa; and Iron Horse� Fitness Room -- all signature features of Great Wolf Lodge, "Snowland" in December transforms the Grand Lobby with Christmas decor plus indoor falling snow, storytime, Santa, holiday animated show, and more. The Log cabin style resort can be seen from I-80 westbound as you near the Scotrun exit.. After you exit trun left for about 200 yards to the entrance on the left. You cannot miss the sign. 1) What time is check-in and check-out? Check-in in begins at 4 p.m., or as your room becomes available. If your room is available earlier, they will be happy to check you in. On your day of departure, check-out time is 11 a.m. Please feel free to utilize the waterpark facilities until closing at 10 p.m. For your convenience there is express check-out via your phone or LodgeNet services. 2) When can you use the waterpark? You are welcome to arrive as early as 1 p.m. to use the waterpark the day of your arrival. Please note that you may experience a wait prior to 4 p.m. due to the high volume of incoming and outgoing guests. Pack a day bag with swimsuits so you can begin using the park and not have to unpack your suitcases. There are shower facilities and lockers available (for a minimal fee) in the waterpark for your convenience. 3) Should you bring towels? The waterpark provides complimentary pool towels during your stay. They request that pool towels remain in the waterpark area, therefore, a bathing suit cover-up or personal beach towel is suggested. 4) Can other people use the waterpark? The waterpark is exclusively reserved for guests. In the event you have visitors during your stay, a limited number of additional wristbands may be purchased for a fee, which varies by location. 5) Can You bring a cooler or tote bag with food into the waterpark? They do no allow coolers or carry-in food into the waterpark for safety and health code reasons. There is however, the Spirit Island Snack Bar or Grizzly Rob's Bar conveniently located within the waterpark and they provide a variety of food and beverage items for purchase. 6) How big are the in-room refrigerators? They are efficiency style, approximately 3 tall and 2 wide with small freezer compartments approximately 5 tall and 18 wide. 7) Is there an ATM? Yes, please see a guest services team member for location information. Unfortunately, for the health and comfort of all of the guests, the do not allow any pets into the Lodge. The do not provide baby-sitting services through the resort. However, if you do require these services please ask at the front desk or concierge and they may be able to assist you in finding a provider. 10) Are flip-flops or aqua-socks required? They recommend, but do not require that footwear be worn in all spaces outside the waterpark for your safety. Aqua-socks are advisable as the waterpark floor is coated in a non-slip formula that can irritate sensitive skin. Footwear is required in all of the restaurant establishments. Locker facilities are available, however space is limited. Please keep in mind that luggage cannot be stored in the lockers. They recommend that you bring a small bag to place your waterpark necessities in. 12) Are all the Suites Non-smoking? 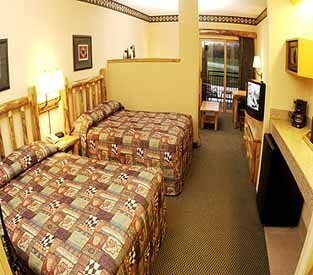 All guest suites at Great Wolf Lodge are non-smoking. Since they are a family resort and strictly adhere to this policy, a $250 deep cleaning charge will be assessed for violation of this policy. As a courtesy to your fellow guests, There are quiet hibernation hours from 11 p.m. to 7:30 a.m. Excessive noise complaints may result in additional charges if it becomes necessary to compensate another guest as a result of non-compliance with quiet time hours. Continued excessive noise complaints may result in your expulsion from the resort without refund. 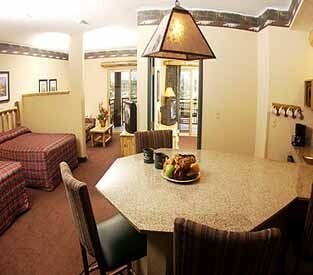 14) Can you bring a DVD or Video Player to be hooked up in the guest suite? Unfortunately the TVs are not compatible with DVD, video players, or video game consoles. However, movies, games and music may be purchased in your suite via the LodgeNet system. 15) Is there a business center? For your business service needs there is a a business center with pay-per-use computers located on the 4th floor which is available to guests 24 hours a day. 16) Is there a fitness room? Yes, the fitness facility is open to guests 24 hours a day 7 days a week with their room key. 17) Is there a laundry room? Yes, the guest laundry room is open 24 hours a day 7 days a week. The washers and dryers take quarters, each costing $1.25. 18) What is the age requirement for children to be in the waterpark by themselves? All children are to be accompanied by a parent or guardian, however, children that are 14 years of age or older may be in the park by themselves. Lifejackets can be worn in the pools and most inner tube waterslides.